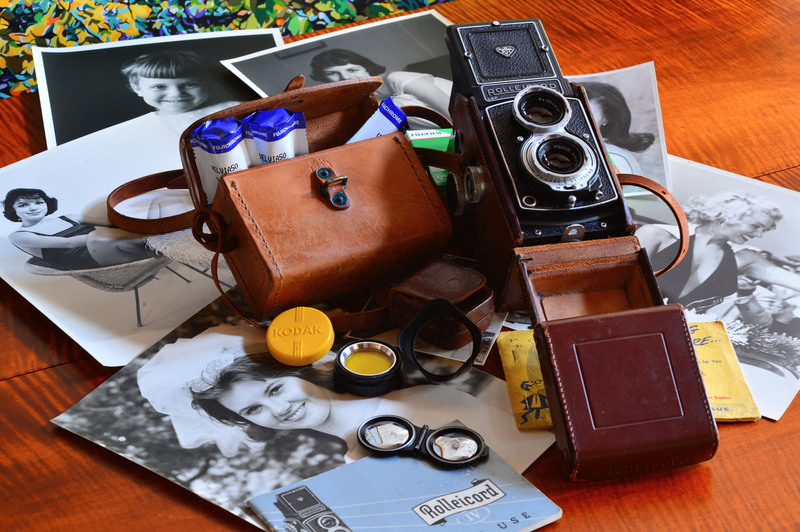 Neal checks in to share with us another cool story about a family heirloom camera. 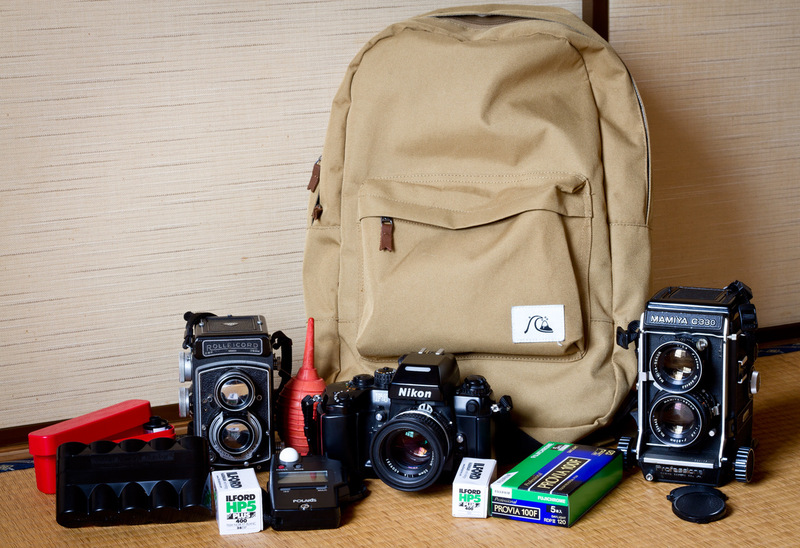 About a year ago I submitted a write-up of one of my father’s camera bags to the Japan Camera Hunter. 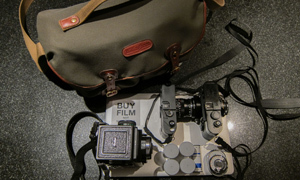 The bag contained an early Konica FP SLR and a bag that was typical of the bags carried during the heyday of film photography. It also provided an opportunity to write a little about my father as he had passed away a few years earlier. All of this can be found “In your bag No: 1394 – George Gause” June 16, 2016. And that I figured was that. But, Dad also had a Rolleicord IV. 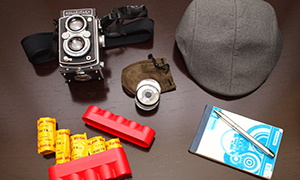 He never carried it in a camera bag however he had — what I’m calling — a leather accessory box he kept with the camera. So technically no actual camera bag is involved as the leather box is too small for the Rolleicord to fit into. The source of the accessory box was a mystery to me although I know Dad always had it. In my mind it was associated with the Rolleicord, but the box was clearly a repurposed item. I figured the source would remain a mystery to me but while examining it I noticed stamped on the box front “E.K. 1943”. A clue — but not much of a clue to track down the box’s story! Then I remembered that the internet is magic. Once I entered the date and initials into my search engine It took only a second to discover what the leather box was and its history. Search result: I had a ‘1943 Enger/Kress’ leather Browning Automatic Rifle (BAR)Tool/ Accessory box. Basically it is a leather box used to carry spare parts and accessories for the BAR. If a soldier was issued the weapon he was also issued the tool/accessary box. A version of the leather box was used in both WWI and WWII as the BAR was used in both wars. The box was usually carried in a pocket of the BAR ammo belt. Photographs taken during WWII sometimes show these pouches modified to be carried on equipment belts by adding hooks or belt loops. Naturally the G.I.s found other unofficial uses for the boxes. So Dad probably acquired his 1943 Enger/Kress during the war. After the war Dad modified it with a strap to carry his Rolleicord paraphernalia. End mystery. The above photograph is Dad and his Rolleicord IV. According to the camera’s warranty card, Dad purchased his Rolleicord IV, on October 10, 1953. The Rolleicord IV is a Twin Lens Reflex (TLR) medium format (120 roll film) camera manufactured from August 1953 until September 1954. My understanding is that it is not a particularly rare camera with 46,500 manufactured. The taking lens is a Schneider-Kreuznach Xenar 1:3.5 75 mm and the viewing lens a Heidosmat 1:3.2 75 mm. Both lenses use a bayonet mount for mounting lens caps, hoods and filters. Finally the shutter is a Synchro Compur MX offering 1 to 1/500 second exposure speeds, Bulb (B) and X-sync settings. I had the Rolleicord CLA’d by Mr. Mark Hama, Marietta, GA and have run a few rolls of Fujichrome Velvia 50 through it. It works and takes great photos. Dad shot black and white film in the Rolleicord. As I mentioned “in your bag No: 1394” Dad had a darkroom where he developed and printed his photographs. Dad was not sentimental about most of his cameras. If he no longer needed a camera he usually sold it to help fund the next one. I guess he never needed to replace the Rolleicord. Thanks for sending us your “bag” shot again Neal, as well as sharing your discovery with us. Hope you enjoy your turn to use it! Camera talk aside, your dad’s outfit is brilliant! This is fantastic. I feel like your dad and my dad would have gotten along wonderfully. 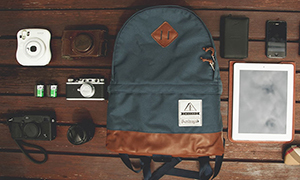 Great looking bag and contents, and I agree your dad looks fantastic in that photo. That’s how want myself to look when I’m out and about with a TLR. You write a great story, and I agree, your dad looks great!